One of the best thing about Android is that how easily and beautiful you can customize your phone. You can setup or customize almost everything on your device from changing your icon pack, widgets, ringtones to install custom launcher. With the help of third party launcher, you can completely change the look and feel of your Android device. Custom launcher provides completely different user interface and various customization options. With the help of custom launcher, you can use different icon packs, use custom grid size, different layouts, add gestures control actions and many more. Nowadays you can also find smart launcher with that not only you set transition or drawer effects, but your launcher will automatically group your apps by categorized also layout of your phone layout will automatically change throughout your day. But many best launcher for android available in play store and many people will be confused which one to use. 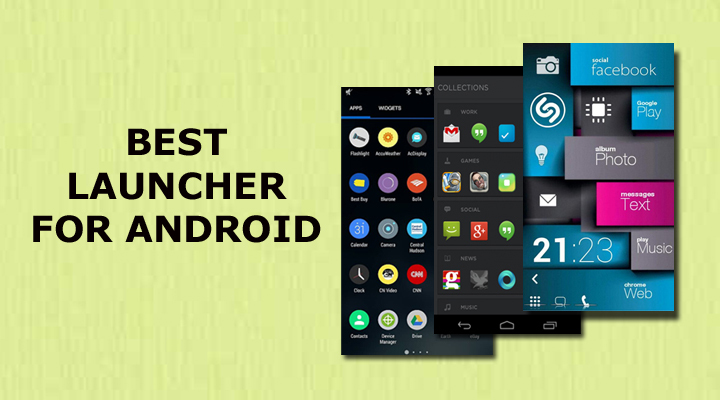 So we decide to post five best launcher for android. Also, check best apps for Android. 1) Nova Launcher – Nova is definitely one of the best launcher for android with more than 10 million downloads in play store. Nova is highly customized, smooth and very fast launcher. Nova launcher gives a stock android like look and feels with many extra customization features. You can hold home screen to add widgets, icon or to add wallpaper. With Nova launcher, you can use custom icons, scrollable dock, change dock background, choose layout vertical or horizontal, scrolling effects, icon swipe action, gesture support or you can put folder or widget in a dock. Some of the features required prime version which is paid but totally worth it. 2) Yahoo Aviate Launcher – Yahoo Aviate Launcher is an intelligent launcher which automatically grouped your app according to category and changed the layout as per time of the day. It keeps things organized like it will show traffic update or weather information during the morning or shows intelligent calendar during work or shows music apps as soon as you plug your earphone. Aviate is one of the best launcher for android if you like your phone organized and clean. 3) Google Now Launcher – Google Now Launcher is a built in launcher for Nexus and Android one devices and now available for everyone. It’s a material designed launcher with built-in Google Now. This is the best launcher for android for whom who love stock look and fan of Google now. You can swipe right side from homescreen to open Google now cards or say ‘oOkayGoogle’ to search anything. It is not a featured pack launcher but a basic stock launcher with little extra customization. 4) Buzz Launcher – If you are a theamer or love heavy customization for your device, you love buzz launcher. With 80000+ user created homepack you can choose the one you love and transform your homescreen with a single click. You can also create your own homescreen and share your homescreen with your friends on social media sites. This is the best homescreen replacement if you love heavy customization. 5) Hola Launcher – Hola is a simple, fast and elegant launcher with a great customization options. The launcher has iphone like drawer or create auto categorized smart folder on one page. It has hola swipe with that you can access recent apps and setting by swiping from bottom corners or swipe up double finger to hide app from drawer with hola box. This is definitely one of the best launcher for android with great options for customization. So these are the best launcher for android in my opinion. Let us know your favourite one by comments below. Lightning Launcher is very good too. Kind of advanced but good. You can Update this list with Total Launcher its a lighter version of buzz launcher with many customizable options but no themes. Thanks I’ll try Total Launcher soon. Another pretty impressive launcher is Arrow Launcher, by Microsoft. I like very much Hola Lanucher, but it have a biggest disadvantage – it have a lot of ads!